The E410 offers similar performance and capabilities to the E400 but gives improved throughput with 802.11 Wave 2 design. The E600 a 4x4 Wave 2 MU-MIMO design with to 512 concurrent client associations, 16 SSID's and 28dB transmit power giving a range of up to 250 metres . 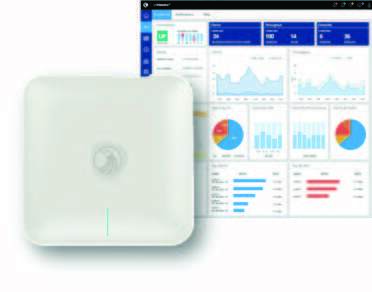 The E series access points offer social media login to Google+ and Facebook, splash pages and voucher generation making them ideal for hotels, coffee shops, camping grounds and office goes WiFi. They offer zero handoff to allow a user walking between access points to maintain a connection rather than it dropping and reconnecting. For the cloud management, an account is created in cnMaestro and the access points are added to the dashboard. cnMaestro can be either a public cloud instance or as a VMware image for a private cloud. Once the access point is purchased there are no recurring licensing fees.